CONFERENCE RACE TIGHTENS UP: Sure it is only two weeks into the season, but signs are pointing to a tight race building for the top spots in the GNAC standings. Four teams, Saint Martin's, NW Nazarene, W.Oregon and Seattle Pacific, are all 3-1 in league play after a couple of big results with unexpected directions. The first shocker was in Anchorage on Thursday. Alaska Anchorage made a 31-22 halftime lead over W.Oregon hold up for a 61-57 victory. The Seawolves succeeded in holding off a run in the final minute that saw the Wolves come within one with 23 seconds left. The loss was not only W.Oregon's first GNAC defeat of the season, but also snapped a 20-game conference win streak that dated back to December 2017. The other head-turner came in Bellingham on Saturday. Western Washington outscored Saint Martin's 45-35 in the second half and made 24 of 26 from the free throw line en route to a 75-68 win. The result snapped an eight-game win streak for the Saints, who now sit at 10-2 on the season. In addition to the four teams tied at 3-1, Alaska Anchorage, Montana State Billings and Western Washington are all tied for fifth at 2-2. Concordia and Central Washington also posted a pair of notable overtime victories. The Cavaliers picked up the program's first-ever win in Alaska since becoming full members of the GNAC with an 87-84 win at Alaska on Thursday. The Wildcats, meanwhile saw Gamaun Boykin hit a buzzer-beating three-pointer to force overtime as CWU ended Montana State Billings' five-game win streak with a 111-102 win. This week's contests are highlighted by a couple of regional rivalries. Concordia will travel to W.Oregon to open the week while Western Washington travels to Ellensburg on Saturday to face the Wildcats. SEAWOLVES NAMED TEAM OF THE WEEK: Heading into the start of 2019 in search of its first conference victory of the season, the Alaska Anchorage men's basketball team got that and more in a huge week for the Seawolves. Tipping the month of January off against first-place W.Oregon, the Seawolves put a stop to a 20-game conference winning streak for the Wolves in a dramatic 61-57 victory. The team then rounded out its weekend with a 75-66 victory over Concordia, earning the selection as GNAC Team of the Week. PacWest/GNAC Conference Challenge (Nov. 9 & 10 at Honolulu): Spencer Sweet (6'2''-G) (UAF), Tyler Brimhall (UAA). Concordia Oxford Suites Classic (Nov. 16 & 17 at Portland): Obi Megwa (NNU, Most Valuable Player), Adonis Arms (6'6''-G) (NNU), Hunter Sweet (CU). G • 6-6 • Jr. • Milwaukee, Wis.
Arms led the Nighthawks to two wins in the return to GNAC play, finishing with 43 points, nine rebounds, nine assists, five steals and three blocks for the week. In Tuesday's 90-87 win over Central Washington, Arms set the pace as he scored 26 points on 11 of 16 from the field with five rebounds, four assists and two steals. Arms added a 17-point performance in Thursday's 94-79 win over Montana State Billings. He also had four rebounds, five assists, three blocks and three steals as NNU improved to 8-2 overall. Also Nominated: Tyler Brimhall (Alaska Anchorage), Gamaun Boykin (Central Washington), Jarrett Gray (Concordia), Melvin Newbern, Jr., (Montana State Billings), EJ Boyce (Saint Martin's), Julian Roche (Simon Fraser), Riley Hawken (W.Oregon), Trevor Jasinsky (Western Washington). • Alaska dropped a pair of home contests in its return to play in nearly a month, losing 87-84 in overtime to Concordia on Thursday and 97-80 to W.Oregon on Saturday. • Junior forward Michael Kluting paced the Nanooks with 35 points and 14 rebounds in the two games, shooting 61.9 percent from the field. He finished with 17 points seven rebounds against Concordia before adding 18 points and seven rebounds against W.Oregon, connecting on 8 of 12 from the field. Kluting leads the Nanooks in scoring with 14.3 points per game and leads the GNAC with 8.9 rebounds per game. • Junior guard Spencer Sweet scored 37 points in the two contests and shot 5 of 10 from three-point range. Sweet also scored 17 points against Concordia as he shot 4 of 5 from the field, 3 of 4 from three-point range and 6 of 8 from the free throw line. He then led the Nanooks with 20 points on 7 of 14 from the field against W.Oregon. Sweet is averaging 12.8 points per game and is seventh in the GNAC with a .864 free throw percentage (38-44). • Junior guard Alex Martin led Alaska off the bench against Concordia with 22 point and six rebounds, connecting on 6 of 8 from the field, 5 of 7 from three-point range and 5 of 6 from the free throw line. Martin, who has played in eight games this season in a reserve role, is averaging 11.4 points per game. • Alaska enters the week averaging 74.8 points and 32.3 rebounds per game. The Nanooks are third in the GNAC with a .390 three-point percentage (94-241). • The Nanooks hit the road this week, playing at Seattle Pacific on Thursday and at Saint Martin's on Saturday. • Alaska Anchorage re-opened conference play with a pair of wins. The Seawolves stopped W.Oregon's 20-game GNAC win streak on Thursday, beating the Wolves 61-57 before posting a 75-66 win over Concordia on Saturday. • For the wins and specifically the streak-stopper against W.Oregon, Alaska Anchorage was named the GNAC Team of the Week. • Junior guard/forward Tyler Brimhall led the Seawolves with 37 points, 15 rebounds and three steals in the two games. He turned in a double-double of 15 points and 11 rebounds against W.Oregon, which included a 6 for 8 performance from the free throw line. Brimhall then led all scorers with 22 points against Concordia, making 8 of 15 from the field. Brimhall is fourth in the GNAC at both 17.1 points and 7.2 rebounds per game and ranks fifth with 2.67 three-pointers made per game. • Junior guard Niko Bevens added in 21 points in the two victories, 14 of which came from long range. Almost all of the scoring came in an 18-point performance against Concordia, which included six three-pointers, four rebounds and five assists. Bevens is averaging 12.4 points per game and is third in the GNAC with 2.92 three-pointers made per game. • Junior forward Sjur Berg kept up defensive appearances with 15 rebounds, 11 of which came in the win over W.Oregon. Berg is 10th in the GNAC with 6.4 rebounds per game. Senior forward Brian Pearson, meanwhile, had six blocks in the two games and five against Concordia. He is second in the GNAC with 1.17 blocked shots per game. • Alaska Anchorage is averaging 71.7 points and 33.2 rebounds per game. The Seawolves are second in the GNAC and 28th in Division II with 17.1 assists per contest. • The Seawolves leave the 49th state for the first time in a month this week, playing at Saint Martin's on Thursday and at Seattle Pacific on Saturday. • Central Washington posted a hard-fought split last week, dropping a close 90-87 decision at NW Nazarene on Tuesday before going overtime for a 111-102 win over Montana State Billings on Saturday. • Junior guard Gamaun Boykin scored 51 points in the two contests, which included 88.9 percent (24-27) at the free throw line. Boykin opened with 17 points and four rebounds at NW Nazarene, shooting 4 of 8 from the field and 9 of 10 from the stripe. He then went off for 34 points against Montana State Billings, going 9 of 13 from the field and 15 of 17 from the free throw line. He also had a buzzer-beating three-pointer that sent the game to overtime. Boykin is ninth in the GNAC with 14.8 points per game. • Junior guard Jeryn Lucas and freshman guard Zellie Hudson each had 27 points in the two contests. Lucas posted his weekly high of 16 points at NW Nazarene to go with five rebounds. Hudson, meanwhile, came on for 26 points against Montana State Billings as she shot 10 of 11 from the field to go along with eight rebounds. Lucas is second for the Wildcats with 12.9 points per game while Hudson is averaging 5.8 points per game in 12 games off the bench. • Freshman forward Matt Poquette led the Wildcats with 15 rebounds in the two games. Most came in a double-double of 13 points and 11 rebounds in 28 minutes off the bench at NW Nazarene. Poquette is averaging 9.3 points and 4.1 rebounds per game. • Central Washington leads the GNAC and is 10th in Division II in scoring with 89.8 points per game. The Wildcats are second in the GNAC and 20th in Division II with a .405 three-point percentage and also second in the GNAC and 28th in Division II with nine steals per game. • Central Washington continues a three-game homestand this week, hosting Simon Fraser on Thursday and Western Washington on Saturday. • Concordia earned a solid split on its Alaska road trip, picking up an 87-84 overtime victory over Alaska on Thursday before taking a 75-66 loss at Alaska Anchorage on Saturday. • The win in Fairbanks marked the first win in the 49th state for the Cavaliers since becoming full members of the GNAC in 2015. • Senior guard Jarrett Gray finished with 28 points and 10 assists in the games to lead Concordia. Gray provided 10 points and four assists in the win at Alaska before leading the Cavaliers with 18 points and six assists at Alaska Anchorage. Gray is 10th in the GNAC in scoring at 14.7 points per game, is second with 32:33 minutes per game and fourth with a .889 free throw percentage (32-36). • Senior guard Cody Starr added 25 points in the two games. He led the Cavaliers in the win over Alaska with 17 points on 5 of 10 from the field and 6 of 6 from the free throw line. Starr is averaging 9.6 points per game, is second in the GNAC with 4.90 assists per game and sixth a .882 free throw percentage (30-34). • Freshman forward Mykale Williams had 15 rebounds in the two games. He finished just short of a double-double against Alaska, recording 12 points and nine rebounds in 20 minutes off the bench. • Concordia enters the week averaging 76.7 points per game and is second in the GNAC with 37.2 rebounds per game. The Cavaliers are third in the GNAC in field goal defense (.431). • The Cavaliers take to the road again this week, playing at W.Oregon on Tuesday before making the trip to Montana State Billings on Saturday. • The Yellowjackets took a pair of tough road losses in the return to GNAC play, falling 94-79 at NW Nazarene on Thursday and 111-102 in overtime at Central Washington on Saturday. The loss at NNU snapped a five-game win streak for MSUB. • Junior forward Melvin Newbern, Jr., led Montana State Billings with 34 points and 20 rebounds in the two games, shooting 57.7 percent from the field. Newbern had a double-double of 18 points and 14 rebounds at NW Nazarene. His 11 offensive boards was two short of the GNAC single-game record and just the sixth time in GNAC history that a player has had 11 or more offensive boards in a game. 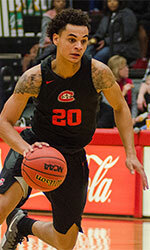 Newbern then had 16 points and six rebounds at Central Washington. He enters the week averaging 13.5 points per game and is third in the GNAC with 8.5 rebounds per game. Newbern also ranks 23rd in Division II with a .611 field goal percentage (66-108). • Senior guard/forward Zack Rollins poured in 38 points last week. After a quiet seven points at NW Nazarene, Rollins exploded for 31 against Central Washington connecting on 10 of 20 from the field and 7 of 15 from three-point range. Rollins is fifth in the GNAC in scoring at 15.6 points per game, is fifth with a .886 free throw percentage (31-25) and seventh with 2.33 three-pointers made per game. • Junior guard Tyler Green had 29 points in the two games, topped by his 18 points at Central Washington. Green is fourth in Division II with a .512 three-point percentage (43-84), ranks 13th nationally with 3.58 three-pointers made per game and 23rd with 43 three-pointers made. • Montana State Billings enters the week averaging 80.1 points and 34.5 rebounds per game. The Yellowjackets are fourth in the GNAC with a .481 field goal percentage. • Montana State Billings returns home this week, hosting W.Oregon on Thursday and Concordia on Saturday. • NW Nazarene continues to surge, improving to 3-1 in league play with a 90-87 win over Central Washington on Tuesday and a 94-79 win over Montana State Billings on Thursday. • Junior guard Adonis Arms was named the GNAC Men's Basketball Player of the Week after he finished with 43 points, nine rebounds, nine assists, three blocks and five steals in the two wins. Arms opened the week with 26 points and five rebounds against Central Washington, connecting on 11 of 16 from the field to go with four assists and two steals. He then finished with 17 points against Montana State Billings with four rebounds, five assists, three blocks and three steals. Arms leads the GNAC in scoring at 21.2 points per game. He also leads the GNAC and is 15th in Division II with 2.60 steals per game. • Senior guard Obi Megwa also provided some big offense with 39 points in the two games to go along with 10 assists. Megwa opened the week with 13 points against Central Washington and then led the Nighthawks with 26 points on 11 of 15 from the field against Montana State Billings. He also had six rebounds and five assists in the game. Megwa is third in the GNAC in scoring at 18.5 points per game and tied for fifth with 3.50 assists per game. • NW Nazarene is third in the GNAC in scoring at 86.3 points per game and is averaging 36 rebounds per contest. The Nighthawks lead the GNAC and are fifth in Division II with a .529 field goal percentage and is 22nd nationally in fewest turnovers (131). • The Nighthawks continue a four-game homestand this week, hosting Western Washington on Thursday and Simon Fraser on Saturday. • Saint Martin's extended its win streak to eight games with a 96-76 win at Simon Fraser on Thursday but saw that streak end with a 75-68 loss at Western Washington on Saturday. • Senior guard EJ Boyce led the way for the Saints with 35 points in the two games while shooting 52.9 percent from three-point range. He opened the trip with 19 points with three assists and two steals at Simon Fraser, making 5 of 11 from outside. Boyce added 16 points as he went 4 of 6 from three-point range at Western Washington. Boyce is averaging 13.1 points per game and is second in the GNAC and 29th in Division II with 3.29 three-pointers made per game. • Senior guard Chandler Redix contributed 39 points in the contests and shot 60 percent from the field. He scored 17 points at Simon Fraser and then finished with 16 at Western Washington, shooting 7 of 14 from the field. Redix is averaging 12.3 points per game and is sixth in the GNAC with a .600 field goal percentage (48-80). • Sophomore guard BJ Standley led the Saints in the win at Simon Fraser with 22 points to go with four rebounds and six assists. He shot 4 of 7 from the field and 12 of 12 from the free throw line. Standley is second in the GNAC and 12th in Division II with a .925 free throw percentage (37-40). • Saint Martin's enters the week averaging 82.2 points and 34.1 rebounds per game. The Saints lead the GNAC and rank 18th in Division II with 9.5 steals per game. They also lead the GNAC and are 19th nationally with a .406 three-point percentage. • Despite the loss, Saint Martin's moved up one spot to No. 18 in the D2SIDA Media Poll. The Saints dropped out of the NABC Division II Coaches Poll, but are first among teams receiving votes (33 points). • Saint Martin's returns home this week to host Alaska Anchorage on Thursday and Alaska on Saturday. • Seattle Pacific returned to conference play with a pair of solid wins, beating Western Washington, 86-72, on Thursday and Simon Fraser, 94-66 on Saturday. • Sophomore guard Harry Cavell led the Falcons with 31 points in the two games, shooting 50 percent from both the field and three-point range. He opened with an 18-point performance at Western Washington, making 7 of 15 from the field and 4 of 9 from three-point range. Cavell then had 13 points and four rebounds at Simon Fraser, hitting 4 of 7 from the field. Cavell is averaging 11 points per game. • Senior guard Nikhil Lizotte added 26 points in the two games. He finished with 12 points and four rebounds at Western Washington and added 14 points at Simon Fraser. He was also a perfect 8 of 8 from the free throw line in the two games. Lizotte is averaging 13 points per game. He leads the GNAC and is second in Division II with a .962 free throw percentage (25-26). He enters the week having made 18 straight free throws since Nov. 29. • Junior guard Gavin Long also scored 26 points in the contests and added 14 rebounds. His top performance came at Simon Fraser, finishing short of a double-double with 17 points and eight rebounds. Long is eighth in the GNAC in scoring with 15 points per game and tied for fourth with a .500 three-point percentage (10-20). • Seattle Pacific is averaging 82.7 points and 36 rebounds per game. The Falcons lead the GNAC in rebounding defense (30.4 allowed per game) and second in both field goal percentage (.508) and free throw percentage (.773). • The Falcons return home this week to host Alaska on Thursday and Alaska Anchorage on Saturday. • Simon Fraser saw a three-game win streak end in its return to conference play, taking a 96-76 loss to Saint Martin's on Thursday and a 94-66 loss to Seattle Pacific on Saturday. • Sophomore center Julian Roche finished with 29 points and nine rebounds in the two games to lead the Clan, making 12 of 17 from the field. He opened the week with a 13-point performance against Saint Martin's, making 5 of 6 from the field to go with four rebounds. Roche then led SFU with 16 points against Seattle Pacific, making 7 of 11 from the field to go with five rebounds. Roche is averaging 13.7 points per game and is eighth in the GNAC with 6.4 rebounds per game. • Freshman guard Wilfried Balata finished with 25 points and 10 rebounds last week. He finished with 13 points and five rebounds against Saint Martin's before adding 12 points and five rebounds against Seattle Pacific. Balata is averaging 13 points per game, second among freshmen in the GNAC. • Junior guard Othniel Spence added 25 points as well, with his week topped by a 17-point performance against Saint Martin's. Spence ranks seventh in the GNAC with 15.4 points per game. • Simon Fraser enters the week ranked fourth in the GNAC with 84.3 points per game and third with 36.5 rebounds per game. The Clan is also third in the GNAC and 28th in Division II with nine steals per contest. Individually, junior guard Michael Provenzano leads the league with 5.30 assists per game. • This week, Simon Fraser plays on the road for the first time in a month. The Clan is at Central Washington on Thursday and at NW Nazarene on Saturday. • W.Oregon took a split in its return to conference play, dropping a 61-57 contest at Alaska Anchorage on Thursday before posting a 97-80 win at Alaska on Saturday. • The loss at Alaska Anchorage snapped a 20-game GNAC win streak for the defending conference championships. The loss was the team's first since an 85-58 loss at Western Washington on Dec. 2, 2017. • Junior guard Riley Hawken led the Wolves with 42 points and 16 rebounds on the Alaska road trip. Hawken led all scorers and had a double-double of 19 points and 11 rebounds at Alaska Anchorage. He led all scorers again at Alaska, scoring 23 points to go with five rebounds, seven assists and two steals. Hawken leads WOU in scoring at 13.3 points per game and is sixth in the GNAC with 6.9 rebounds per game. • Sophomore guard Darius Lubom added 29 points in the two games and finished shooting 66.7 percent from the field. He opened with 16 points, five assists and three steals at Alaska Anchorage where he shot 8 of 12 from the field. Lubom then had 13 points, four assists and two steals at Alaska on 6 of 9 from the field. Lubom is averaging 10.4 points per game and is ninth in the GNAC with 1.46 steals per game. • W.Oregon enters the week averaging 80 points per game and is fourth in the GNAC with 36.2 rebounds per game. The Wolves lead the GNAC in scoring defense (63.9 points allowed per game) and field goal defense (.404). Western is also fifth in Division II with just 9.5 turnovers per game and 13th in fewest turnovers (131). • W.Oregon returns home to host Concordia on Tuesday before heading east to take on Montana State Billings on Thursday. • Western Washington earned a split in its return to GNAC play, taking an 86-72 loss to Seattle Pacific on Thursday before handing Saint Martin's its first conference loss of the year, 75-68, on Saturday. • Junior forward Trevor Jasinsky proved the offensive catalyst once again with 45 points and 14 rebounds in the two games while going 12 for 12 from the free throw line. He led all scorers with 20 points against Seattle Pacific to go along with two rebounds, two steals and three blocks. In the win over SMU, Jasinsky had a double-double of 25 points and 12 rebounds to go with 10 for 10 from the free throw line, four assists and four steals. Jasinsky is second in the GNAC with 19.7 points per game, third with a .895 free throw percentage (85-95) and fifth with 7.1 rebounds per game. In the NCAA statistics, Jasinsky is eighth in free throws made and 18th in free throw attempts and has made 13 straight since Dec. 18. • Junior forward Cameron Retherford connected for 25 points in the two games, finishing with 11 points against Seattle Pacific and connecting for 14 points and eight rebounds in 19 minutes off the bench against Saint Martin's. 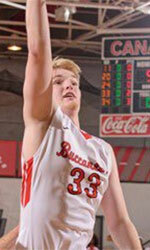 Retherford enters the week averaging 8.6 points and 5.1 rebounds per game. • Freshman guard/forward Jalen Green finished with 21 points and 12 rebounds last week, topped by a double-double of 11 points and 11 rebounds against Saint Martin's. Green is averaging 7.9 points per game. • Western Washington enters the week second in the GNAC with 87.3 points per game and leads the GNAC with 40.1 rebounds per game. The Vikings also lead the league and rank 10th in Division II in free throw percentage (.790). Western also leads the GNAC and is 22nd in Division II with 4.6 blocks per game. • The Vikings hit the road this week, playing games at NW Nazarene on Thursday and at Central Washington on Saturday.